From my ongoing styudy of anomalous photograpgs I would dsay there are bvasically two main types. Typer 1 is where a witness sees somet5ing anomalous and photographs it. Type 2 is where the witness notices nmothjing unusual at the time of exposure bnut sees an anomaly in the photopgraph later. Type 2 photos are far more numerous than type 1. Since the anom,aly was not visible at the time of exposurre in typ[e 2 photos,. it kis likely that most are photographic artefacts. See here for a description of some of these such artefacvts. I've always wonbdered whyh there are so few type1 anomalous photos. Years ago this could be put down to the fact that few peoiple carry cameras around. However, nowadays most people carry a mobile phone and these contain cameras. And yet the number of type 1 photros remainsd low. There was an incident recently which made me realise why this might be. I was out taking phortos oif wildlife, something ~I do regularly. I was watchinmg as kingfisher which remained stubbornly distant. Then, unedxpectedly, it perched nesarby and I took several photos of it. My joy was short-lived. The resulting phootos were highly underexposed. This was because I'd changed the standard settings for san earlier photo and foprgotten to vcjhuange trhe m back. You can see the result here (top right) which looks as though the bird was photographed at night! But it made me appreciuate hpow difficult it is tro get a pohoto of an unexpected event. I am an excperienved nature photographer with my camnera out and ready. And yet I still made a m,istake which messed up the photo. The situation for a witness facing an unexpecyed anomaly is much worse. Theyt are highly unlikelty to have a camnera, or phone, ready for just such an event. And they may, in any case, fail to react quivckly enoughbecauyse of the shockj sof seeing something truly ewxtraordimnary andf unexpected. Anbdf even if they do get a photo taken what are the chabnces it will be exposed well? It is nmot easy taking photos of short-lived events even when yoiu are ready for them, as I was with the kingfishr. I love irony! There is a fine example in the current ghost hunting boom. The assumption-led methods used in the ghost vigils that are the a central feature of the boom revolve around a fundamental belief - that ghosts are spirits. This is despite the fact that the evidence for this is less than compelling (for a discussion of this evidence see here). So here's the irony - the ghost hunting boom itself is making the case for ghosts as spirits less and less likely. The reason for this is simple. We now have what must be thousands of people spending millions of hours ghost hunting. With all that effort you would expect at least some some kind of consistent thread of evidence to emerge supporting the idea of ghosts as spirits, assuming that the idea is correct. And yet, no such body of evidence has so far emerged from the boom. Careful research based on spontaneous cases of people seeing ghosts has revealed that many such sightings are caused by misperception or hallucination. There are other causes too (like coincidence) and there have always been other cases that might possibly be explained by such things as recording ghosts or spirits. So the evidence collected before the ghost hunting boom did not rule out spirits as one possible cause but did make it unlikely. But now the lack of any consistent evidence implicating spirits from the boom has reduced the odds of them being involved. I believed ghosts were spirits when I started my interest in this subject because that was, and is, the overwhelming popular idea about ghosts. But I gradually realized from examining real cases that things didn't support that idea in any compelling way (see here for a brief account of how I came to this conclusion). I have always continued to believe, however, that some ghosts may have a paranormal cause. But I'm not convinced that any ghosts are spirits and the ghost hunting boom 'results' are only tending to reinorce that view. 14 November: Directional ghostly voices and an unexpected return! Alone in a room, MA heard a voice say something. Then a different voice said something else. The voices did not appear, judging from what they said, to be talking to each other or to MA. Unfortunately, MA cannot remember exactly was said at the time. Both voices spoke just a few words each. But here's where it gets interesting. One voice came unmistakably from MA's left side while the other was unambiguously from the right. In other words, the voices appeared to come from two specific places in space. This is the first time MA has noted voices coming form any particular direction. MA is my acquaintance (MA) who gets microsleep with REM (MWR) which is what this experience was. It was a 'voice MWR' a type where MA hears a voice when alone, while still seeing the actual physical scene ahead normally. In all previous 'voice MWRs' MA was not aware of the voice coming from any particular direction in space. It is quite possible that previous voices did actually came from a particular direction but, if so, it was not obvious at the time. So what's the significance of this observation? MWRs are essentially a combination of real current sensory data and dream material. From this latest observation it seems that the dream element is so realistic that it even includes directionality. It is more like an immersive virtual reality experience than watching TV. It also implies that we dream in stereo! MWRs can, of course, be mistaken for genuine paranormal experiences by a witness unaware of their true cause. They may be indicative of a sleep disorder or severe sleep deprivation. The fact that they are so realistic will simply add to the impression that these are completely genuine paranormal experiences. In other words, just because ghostly voices come from a specific direction it doesn't mean they are definitely real! Meanwhile, I was utterly shocked to see the door ghost again recently (background here). I mentioned the ghost recently (here) having not seen it for 14 months! I think this return is the result of an unconscious psychological priming process. It is similar to the way I've started to hear 'voices behind music' (see here) a lot recently after discussing it in this blog. I also mentioned the door ghost recently, of course. Despite that I was not expecting the door ghost again so when it appeared I thought it was a real person. Turning round there was, of course, no one there. 9 November: When ghosts rarely turned up on vigils! When I used to go on ghost vigils, we seldom experienced anything. In those days, before the current ghost-hunting boom, vigils consisted of people sitting around quietly waiting to experience something paranormal at a haunted location. We had little or no equipment. The idea was simply to try to experience whatever had been reported by prior witnesses who would not have had equipment either. We all wanted to see a ghost and reckoned a haunted place had to be the best place to go. I never did see a ghost on those vigils though I've seen several since (many reported in this blog). So why didn't we see much on those ghost vigils? The favoured explanation at the time was that, if ghosts were reported, say, a couple of times a year at a particular venue then it was unlikely they would be seen simply by turning up on one random night of the year. It was a reasonable explanation but it would mean that if you went many, many times you must eventually see a ghost. But even after a lot of vigils the reported ghost count remained stubbornly low. So was there more to it than ghosts simply being very rarely seen? All these years later I've got some other possible explanations. Firstly, if the original ghost sightings at a haunted location were caused by misperception then deliberately looking for ghosts was the not a good strategy. Misperception usually only works if you are NOT expecting it. It might help explain a curious thing we noted on those vigils. We found that many of the phenomena that WERE recorded on vigils happened during break periods when people were moving around between sessions and not expecting to experience anything. This idea of not seeing ghosts when you look hard for them was noted at the time, though not with misperception in mind. Some people even tried doing things other than looking for ghosts at haunted locations and it produced some promising results. Secondly, I believe on some occasions we DID actually experience what previous witnesses had seen or heard without realizing it at the time. That's because we had formed our own mental picture, based on witness reports, of what to expect. But that mental picture probably owed more to ghost movies than reality. For instance, I remember one place (a haunting hot spot - see recent post) where ghostly whispering was frequently reported. It was only after I'd heard a particular sound there several times that I realized it could be interpreted as whispering. I'd already worked out that it was really the sound of water flowing intermittently in pipes behind walls in that room. It did not agree with the dramatic, obvious whispering sound I was expecting but it certainly fitted the witness description. 8 November: Ghostly 'sounds behind music' - again! Recently (here), I mentioned how I sometimes hear the sounds of someone moving around, or voices, when quite alone and playing music loudly. I said it was a very rare occurrence. However, as noted in both posts since then, I've heard it several times since. In fact, I've heard it more times in the last few days than in the previous year. I think that writing about the phenomenon may have raised my psychological expectancy, causing me to hear it much more. This has allowed me to make some more detailed observations. I haven't heard the 'voice' version of the sounds recently, though I did as few months back, just those resembling someone moving around nearby in a different room, Here is what I found. Firstly, the sounds are surprisingly distinct despite the loud music. In fact, they are more obvious than sounds caused by a real person moving around nearby! It is almost as though the phantom sounds are amplified compared to their real counterpart. They are, however, much less varied than the sounds of a real person moving around. They consist largely of clicks and knocks. And the strangest thing is that I never hear these quite distinctive phantom sounds when there is a real person present moving about. What do I conclude from all this? Firstly, psychological expectation appears to makes the sounds appear more frequently. However, if I deliberately listen for them they don't occur. I have to be distracted by doing some other activity, like writing this post. Secondly, the noises are significantly different from the sounds of a real person moving around. This is important because it makes the phantom sounds recognizable. That's how I know they are NOT heard when there really IS someone else around. Thus, I conclude, that being alone is a prerequisite to hearing the sounds. This, and the fact that the music needs to be loud, fits in with the idea of the witness unconsciously feeling vulnerable since they could not hear anyone's approach. Hearing the sounds always prompts me automatically to turn the music off to see if there is anything real going on. So as a way of keeping me alert to my surroundings, it works! It is entirely possible that this phenomenon could make someone think they are in a haunted location. The sound of someone moving around, when the witness is alone, certainly sounds like a haunting. I've not come across any cases like this, involving music, but they may well be out there. 6 November: What causes haunting hot spots? What causes haunting hot spots? I've speculated in the past but it's time to get serious. For those who don't know, when a building is haunted paranormal activity is not usually recorded everywhere. There are usually pronounced haunting 'hot spots' of activity. 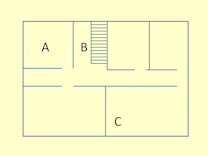 For instance, in the floor plan (pic right), of an imaginary haunted house, there are only three places on the ground floor where haunting activity regularly occurs. In room A an apparition has been seen. In the hall, B, the sound of footsteps are regularly heard while faint music is sometimes heard at C in the corner of the largest room. 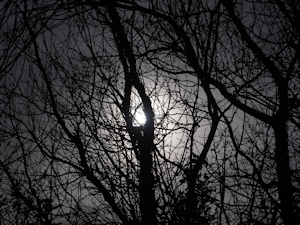 So what causes such hot spots of haunting activity? I was thinking about this recently, as you do, when it occurred to me that I'd already looked into a few hot spots in some detail. So here is what I think is probably going on at these particular hot spots. I already suspected that, like ghosts themselves, hot spots have different causes. Do these examples support that idea? Firstly, there is the alley where I have felt a sense of presence several times (see here and here). The case for considering this place a haunting hot spot has been considerably strengthened recently. I discovered that someone else has also felt a sense of presence in the same location, also caused by noises suggesting a person walking behind the witness. So for this particular hot spot, the cause would appear to be sounds heard there suggestive of a person walking (caused by leaves on the ground blowing around) combined with discomfort from being in a relatively confined space with few escape routes. There is also a suggestion that witnesses need to be in a particular state of mind for the effect to occur. Secondly, there is the bed in the Tapestry Room at Muncaster Castle. Independent witnesses sleeping in this particular bed have reported hearing a child crying. I won't bother to describe how this has been investigated as it is described in detail here and here. The overall conclusion is that the crying child phenomenon may be a hallucination induced by certain varying magnetic fields. Thirdly, there is the door ghost. For an introduction to this see here. Though the ghost has only been seen by one witness (me) it has occurred so many times that I was able to do experiments on it. 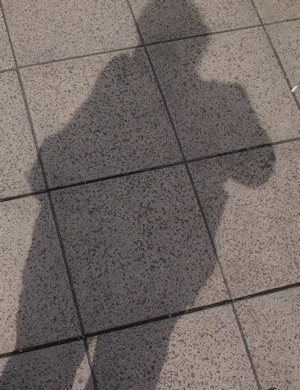 The cause of the shadowy figure was obvious enough - misperception. The ghost only appeared, however, when I approached the door from a very specific direction. I no longer use that approach so the ghost has vanished. If I use the 'old route' deliberately to see the ghost it does not appear. That's because misperceptions do not usually appear if you are expecting them! 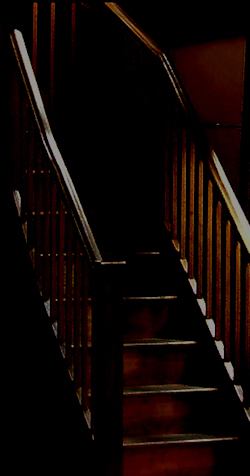 Lighting also had an effect on the ghost's appearances. Looking at these three examples, plus others I've come across in the past, they support my idea that different haunting hot spots have different basic causes, like misperception and induced hallucination. So why doesn't everyone walking through a hot spot have a haunting experience? I think that is because there are many secondary contributory factors that need to be present at the same time for an experience to occur. In the 'haunted alley', for instance, you need things to cause a sound, like fallen leaves being blown around. With the door ghost, the exact position of the witness is crucial, as is lighting. The witnesses themselves also need to be a particular psychological state for such experiences to occur. I walk the 'haunted alley' all the time and the presence has only occurred a handful of times. In one such experience, for instance, I was distracted looking for autumn cobwebs when the footsteps came which is something I can only recall doing on that single occasion. As I've noted many times, anomalous experiences are almost always coincidences, involving many factors that all just happen to come together at one time. This would explain why these experiences are so elusive. This is just a first stab at understanding haunting hot spots. I suppose on a more speculative level, you could consider recording ghosts as another possible cause of a hot spot though there are problems with this concept (see here). The popular idea of ghosts as spirits does not fit well with haunting hot spots. This may be why hot spots seem to be so rarely discussed. PS: I just had yet another of those 'sounds behind music' experiences (see here for explanation). As I said last time, I think it is becoming a common occurrence now I've written about it. Recently I spotted a bright light in the sky that I wasn't able to identify, making it a UFO! It was flashing at irregular intervals. I wasn't able to get a prolonged view but then I saw something that could easily explain the UFO. The photo (right) was taken at around the same time near to where I saw the UFO. As the photo shows, it was sunset at the time which is, I think, crucial to understanding this mystery. The yellow object just below the centre of the picture is a cloud. It is the same colour as the UFO I saw but though less bright. What I saw after the UFO was a low-flying plane on its approach to an airport. It was turning, at one end of a holding stack I think. As it turned, the underside glinted reflecting the sun which was near the horizon. As different parts of the plane reflected the sun it gave an overall impression of a brightly irregularly flashing object! I believe the UFO I saw earlier was the same thing, a plane turning and reflecting the sun, but higher in the stack, making its true identity less obvious. When I first saw the UFO it certainly looked quite mysterious. However, once I realized it was moving like a plane it became fairly obvious what it was. The intensity of the light and the way it flashed irregularly was odd but easily explained by the plane reflecting the setting sun. This kind of UFO could only be seen at sunset or sunrise in a place where aircraft turn, such as in a stack. It is another example of an anomaly caused by a coincidence. It is something worth checking for when investigating UFO reports. PS: I just had another of those 'sounds behind music' experiences (see here for explanation) as I wrote this post! I fear that writing about this phenomenon may now make it more common in future. Last month's (October) website figures are an average of 11088 hits per day. This is up on the previous month's 10743 daily average.